Construct Numerous Key Biochemicals with One Kit. Produce amino acids, sugars and much more! Illustrate a variety of sugars, amino acids, triglycerides, and peptide bonds. You can also demonstrate functional groups containing oxygen such as alcohols, aldehydes, ketones, acids, ethers, emols, acetals, ketals, and esters, as well as functional groups with nitrogen such as nonsteroidal hormones, vitamins, DNA bases, and 1°, 2°, 3° amides. The models are easy to set up and are flexible, durable, and economical. 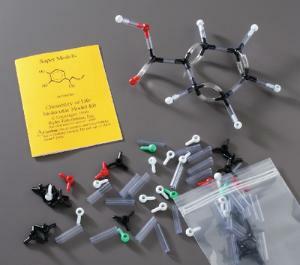 The kit includes 22 carbons, six oxygens, 20 hydrogens, four halogens, four nitrogens, and 48 connectors to make single, double, and triple bonds, as well as an instruction sheet.